By 2025, 75% of the global workforce will be Millennials. The group otherwise known as Generation Y (people born early 1980’s to early 2000’s), are coming to an age where they can be regularly considered for leadership roles in most businesses. While they might get a bad rap for the things we hear about all the time, like being lazy or entitled, there are quite a few studies that say otherwise. Regardless of your notions of this younger generation, they’re a large portion of today’s workforce and that cannot be ignored. This is especially the case for field service industries such as lawn maintenance, irrigation, snow plowing and other lines of physically taxing work. Millennials are needed for these jobs. And as they stay with a company long enough and continue to build their skills, they will eventually work their way up the rungs and become leadership whether you’re ready or not. How can you ensure that they’re ready to fall into those positions as they open up? What can you do as a leader to prepare them for more responsibility? 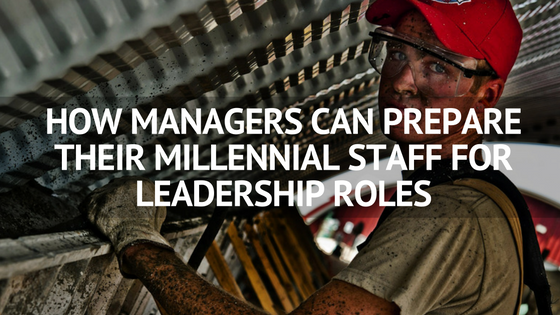 Here are a few ways that managers can help Millennials prepare for leadership roles. Communication is a key component of preparing Millennials. Get to know what your younger employees’ goals are. As a business owner or manager, you’ll likely want to keep these employees on as long as possible. If you know what their goals are upfront, you’ll be able to develop that person for the role he/she wants down the road. In a study done by Deloitte, a large business consultancy, they found that 25% of Millennials are asking for a chance to show their leadership skills within their company. Some of your staff might be more vocal, but you should know everyone’s goals and train accordingly. One of the best ways to prepare your Millennial crew members is by providing as much education as possible. Beyond your standard training, provide employees that are interested in the work with learning opportunities. That might mean sending them to continuing-ed classes or even just pairing them up on jobs with more experienced crew members. An employee who is willing to learn new skills is extremely valuable to your business. Millennials often get pegged as immature and unprofessional. By and large, this is just a preconceived notion that older generations make based off of a few bad experiences (hey, it isn’t their fault if you don’t like your annoying nephew that has his phone too much). Even if it is an unfair assumption, you need to do your best to lead by example. Be the leader that you want them to be. Do the right things consistently and make it a habit. One way that you can develop your Millennial staff is by allowing them to run the ball every now and then. If you have a job that you feel they might be able to take the lead on, give them a shot. Let them plan it out, all the way from estimating to performing the work. Give them feedback along the way. Showing them that you want them to take initiative will help in their personal development. Give them a chance - if a mistake is made, give constructive criticism, if they do a great job, let them know. This might be one of the biggest sticking points for managers working with Millennial employees. Simply put, employees on their phones drive managers crazy! I worked for a tennis court resurfacing business for a few years. If I had a dollar for every time that my boss yelled at my co-workers (ok, he yelled at me every now and then, too) for being on their phone, I would have made more money from that than on my regular wages! Maybe I should have disclosed this earlier, but I, Taylor, am also a Millennial. I like my technology, I like my social media and there are times that I mix those things with my work. But here is the thing, technology and work can mix. One way that you can help develop the younger generation in your business is by letting them manage your social media accounts or by letting them do some web-work if appropriate. If they show an interest in technology, let them use their knowledge to help grow your business. Give them a chance to move the needle by using technology to generate leads. The bottom line is that whether you’re ready or not, the Millennials are coming! It benefits you to be ready for them, it benefits you to groom them for future success and it benefits your business when you utilize their unique mindset and skills. One thing that all Millennials know is the power of technology. Take a page from their book and learn how technology can help grow your business! Download theLocal SEO for Green Industry Businesses eBook today.